It’s not just the number of input/output connections on a video display that’s important, but rather the type. You should ensure that your video display has the right inputs to connect the source devices that will feed video into your home theater. Keep in mind that most video source devices have multiple types of video outputs, and that you can get the best picture quality if you use the right connection methods. You should connect most or all source devices directly to your A/V receiver, not your display, to simplify both hookup and operation. So it’s typically not important to have, for example, four different S-video inputs on the back of your TV. You’ll connect all S-video sources directly to your receiver and will need only a single S-video cable connecting the receiver to your TV. You should also expect to have a pair of analog audio inputs for each of these inputs (except for HDMI, which carries the audio on the same cable as it carries the video). Component video: If your A/V receiver can’t handle high-definition signals through its component video inputs (almost all new home theater receivers can, but many older models can handle only DVD and not HDTV), you’ll want to have at least two sets of component video inputs on your display. HDMI: HDMI is rapidly becoming the method for connecting source components to high-definition TVs. Many A/V receivers don’t have HDMI video-switching capabilities, and many that do can accept only a couple of HDMI inputs. If you’re buying a new display, you should look for one that has three HDMI inputs, to increase your options and give you some more flexibility when you add new components such as a Blu-ray disc player or a high-definition gaming console to your home theater. 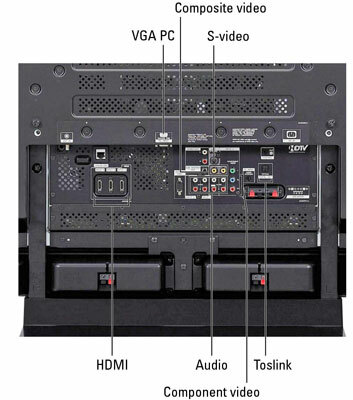 If you own a camcorder or some other portable video source device (such as a laptop computer that you may want to connect occasionally to your home theater display), you may want to choose a display with a set of A/V connectors on the front of the unit. It’s a lot easier to make quick, temporary connections this way than it is to try to climb behind your display and hook things up. Look for a display that has at least one set of analog audio and video (preferably both composite and S-video) connections on the front. You may find component video or even HDMI front inputs on your HDTV, which is great if you have a gaming console or high-definition camcorder that you want to move between TVs. Note that many flat-panel TVs, as well as microdisplay rear-projection models, hide these inputs on the side or even the bottom (for wall-mounted displays) of the TV.